Having spent most of my adult life working in football I totally understand why Sean McDermott and Brandon Beane are doing what they are doing. But I also know and understand why some fans would be confused. First, let’s look at the recent history of the Bills. 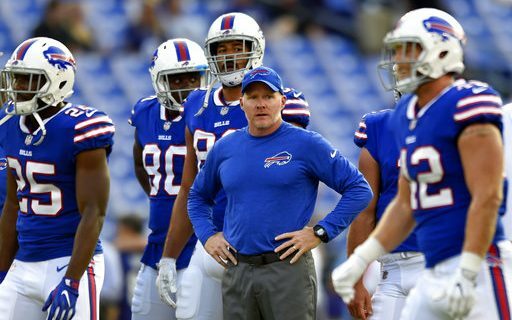 Sean McDermott is the third Head Coach the Bills have had in four seasons. Each coach has his own way of doing things. He hires coordinators who come close to meeting that philosophy, as far as the style of play they want the players taught. On offense, many if not most players can fit into different schemes, except for maybe the offensive line. Defense though is another story. There are so many different variations of the 3-4 or 4-3 schemes used in the league. In each scheme the coordinator wants a certain type of player for each position. Many clubs have their position coaches write up a “profile” so to speak, of the traits they are looking for at each position. It starts with size, length, strength, speed and athleticism and then works its way into instincts and intelligence. There are many players who fit very nicely into one scheme, but just can’t play in another. It’s often because they don’t physically meet the criteria the coaches are looking for. In the case of Darby, he is a good man cover guy but can struggle in zone and he lacks top ball skills. In the Bills new scheme ball skills and zone coverage skills are very important to play the position the way the coaches want it played. Why Was Reggie Ragland Traded? At the Mike (middle) linebacker position, athleticism and instincts are premium traits wanted by the coaches. Ragland has very average athletic ability and lacks top instincts. He is more of a reactor than an anticipator. He was traded to Kansas City where he more closely fits what they ask their inside linebackers to do. The player who won the Mike job, Preston Brown, may also not be a great fit. But he is a better fit than Ragland. This is a position that the Bills may still try to upgrade next year in either free agency or the Draft. Why Was Sammy Watkins Traded? With Sammy Watkins, it was not a case of physical fit but rather durability and sign-ability. Watkins has not lived up to his draft status because he hasn’t been able to stay healthy. The new Bills regime would rather develop their own players at the position than pay a premium for a guy who has had trouble staying on the field and playing to his draft value. Over the next week as we see more player cuts at the final cut down and waiver acquisitions made, the players you see let go are either not good enough or don’t fit the scheme. You can bet that new players brought in will fit. Being that the Bills have played in three different schemes in the last four years, the fix can’t happen overnight. The 2017 season will almost be a tryout for many players on the roster. The coaching staff and front office will know who they want or don’t want much better next February than they do today. They will know who they can trust and rely on. Next spring in free agency and again in the Draft. The players you see the Bills sign or draft will more closely fit the plan. It will be an ongoing process that can’t be done overnight. One of the reasons clubs have success in the NFL is continuity and that is something that the Buffalo Bills have not had in recent years. My feeling is that the current Bills coaching staff and front office is the best the Bills have had since Marv Levy and John Butler were partners as coach and GM. Give this group a chance, they have the talent to turn the franchise around but it will take time. I don’t see the Bill making the playoffs in 2017 but if the right kind of player acquisitions can be made, 2018 could be a very good year for the Buffalo Bills. Visit here for more of Greg Gabriel’s NFL experienced-based opinions.